Nearly as hardy as any Oriental hybrid, L. auratum var. platyphyllum was instrumental in the development of the now lost 'Imperial Gold' strain and the magnificent 'Empress of India'. 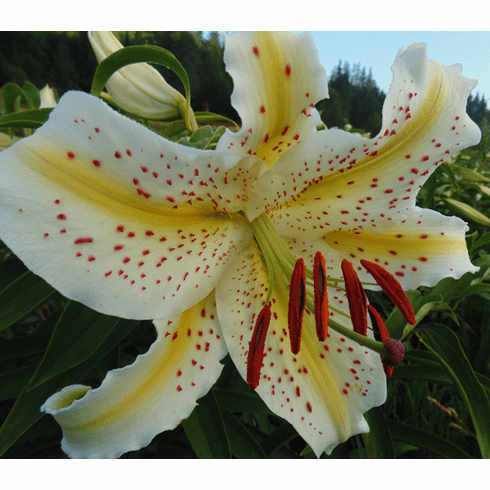 The 'Golden-rayed Lily' of Japan. It was at one time found in great numbers on the Island of Honshu but harvesting for food seems to have decimated the populations. It is now protected. Seed is hypogeal germination if warm, but in nature is delayed until spring warmth returns. This lily needs excellent drainage in order to survive winters. Photo insert #1 is of a stem of 'L. auratum' photographed by Herman V. Wall for Oregon Bulb Farm. Courtesy of Edward McRae. Photo insert #2. Bed of L. auratum circ. 1960 at Oregon Bulb Farm. Photo insert #3. Hybrid of L. auratum x L. henryi Japan hybrid #82111. Photo insert #4 'Empress of India'. Photo courtesy of Edward McRae.